1. Dow 25,000 in sight: The Dow Jones industrial average is less than 80 points away from hitting 25,000 points. The milestone would have seemed a long way off to investors just a year ago, when the Dow was below 20,000. 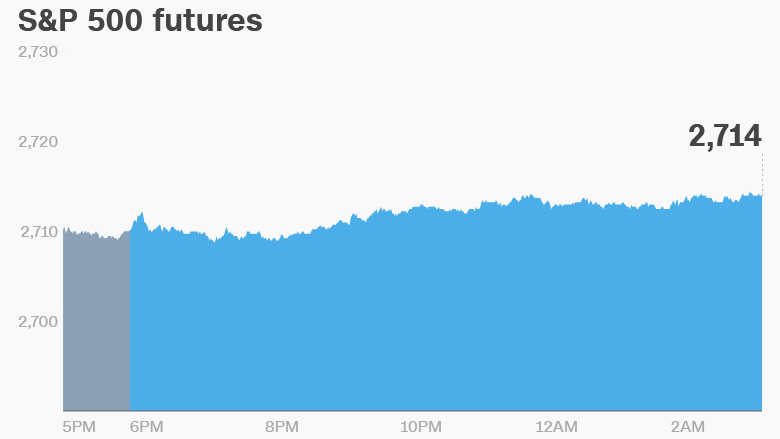 The first two trading days of 2018 have each brought new stock market records in the U.S. Today could be another big day as U.S. stock futures move higher. Stock markets in other parts of the world are also buoyant, with some European indexes climbing by about 1%. Asian markets ended the day with gains. The Nikkei index in Japan stood out with a 3.3% jump as trading relaunched in Tokyo following an extended holiday. 2. Computer chip crisis: Intel (INTC) and AMD (AMD) are in focus after researchers revealed that two major flaws in computer chips could leave a huge number of computers and smartphones vulnerable to security issues. The flaws, called Meltdown and Spectre, exist in processors. Meltdown appears to be specific to Intel chips. The Spectre flaw was found in Intel, AMD and ARM processors. AMD said there is a "near zero risk of exploitation" for one of the security issues, due to architecture differences. Its shares are pushing up by 4% in premarket trading. ARM said in a statement a small subset of its processors are susceptible to the flaws. ARM is owned by SoftBank (SFTBY). 3. Tesla trouble: There's negative news swirling around Tesla on Thursday morning and that could put pressure on shares when the markets open. Tesla (TSLA) said on Wednesday it's still way behind on its Model 3 production goals, producing just 2,425 of the sedans over the last three months. Tesla said last year that it hoped to be making 5,000 Model 3s per week by the end of 2017. Still, the company promised it has "made major progress addressing Model 3 production bottlenecks." 4. Earnings and economics: Monsanto (MON) and Walgreens (WBA) plan to release earnings before the open, while Franklin Covey (FC) and Sonic (SONC) plan to release earnings after the close. The U.S. Crude Inventories report is set to be released at 11 a.m. ET. Crude oil prices are currently surging to trade around $62 per barrel, a level not seen since late 2014.